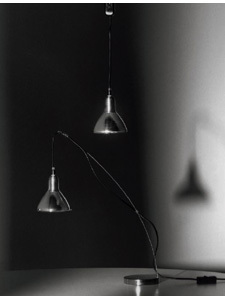 The Grasl and Grasl Vulgaris Pendants and Table lamps from Ingo Maurer are simple and elegant. The table lamp has a base of nickel-plated cast iron with matte finish and a flexible extension rod that is nickel-plated. The Pendant has a transparent cable, plug and switch. The reflector has two finish options: Grasl: anodized aluminum and brass or Grasl Vulgaris: aluminum with "corragated" surface. Usually ships in 8-12 weeks.